DuraHook™ , "The Stay Put Hook" is the first 2-point locking pegboard hooks that always stay put and mount both vertically and horizontally on all types of pegboard. • DuraHook’s unique double-locking mechanism keeps pegboard hooks and tools in place, even after repeated use or relocation. 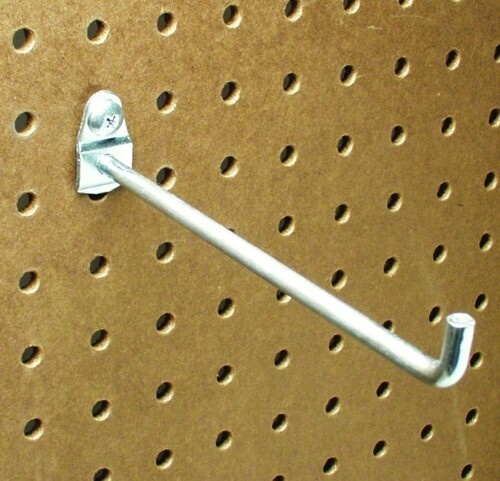 These locking hooks will never fall out of pegboards. • DuraHook is the first pegboard hook that fits both 1/8-inch and 1/4-inch pegboard, perforated hardboard, tempered hardboard and DuraBoard™—simply change the LocScrew™ included with each pack. • DuraHook’s rugged 3/16” and 1/4” bright zinc-plated steel construction is designed and tested to meet the toughest home, commercial and industrial applications with the ability to hold heavy power, hand and yard tools in styles never before offered. • Each DuraHook mounts in four different positions, capable of accommodating virtually any tool, accessory or object.